Product #1862 | SKU MBAG80N | 0.0 (no ratings yet) Thanks for your rating! 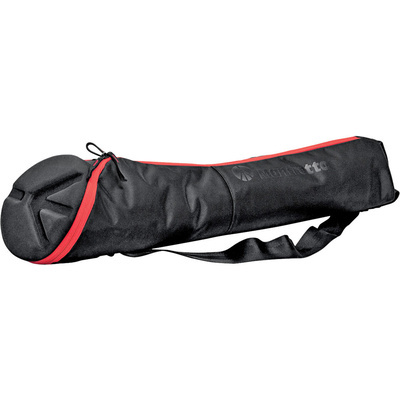 The Manfrotto by Bogen Imaging MBAG80N Tripod Bag (Black) is an unpadded ballistic nylon bag designed to carry Manfrotto tripods with head up to 77 cm long. However, it's always best to leave 1-2 inches of free space to make storing your tripod easier. The end cap is padded to offer protection to the tripod head. The zipper extends down the length of the bag, but also fully opens the top end of the bag. The end opening allows for faster "quiver" style extraction and insertion of the tripod. The tripod legs fit comfortably in the narrower end and extra space is allowed for the larger volume of the head at the wider end. This also means it's easier to put the tripod and head in the bag, even if the head levers and knobs are fitted and jut out slightly. The bag includes a shoulder strap. Accommodates Manfrotto tripod with head up to 30.31" long. However, it's always best to leave 1-2 inches of free space to make storing your tripod easier.